Wire looms are not included in the 6 Cyl or V8 kits. 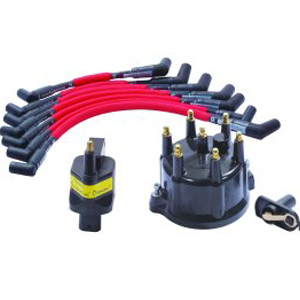 The Jeep Screamin Demon Coil allows spark plug gaps to be opened up to a whopping .065″! This larger plug gap exposes more spark in the combustion chamber for a more complete burn of the fuel mixture which increases horsepower, gas mileage and keeps spark plugs cleaner. The Screamin’ Demon Coil features a brass terminal, which is more conductive and resists corrosion longer than the aluminum terminal on the stock coil. The Screamin Demon Coil is too hot for stock plug wires so a high quality wire such as our LiveWires must be used with it. This coil mounts in the original factory location. 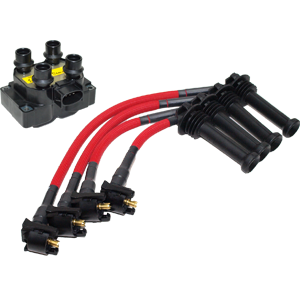 The LiveWires for the Jeep 2.5/4.0/5.2 are a high quality, low resistance spark plug wire built with a protective heat sleeve. The glass braided sleeving is designed to protect the wires up to 1400 degrees F. This promotes longer wire life due to the heat protection! The spiral wound core will prevent electronic interference with the radio. The LiveWires are precut and numbered at each end for the correct cylinder allowing for easy installation. The LiveWires measure 10mm in diameter for great performance and an awesome look. 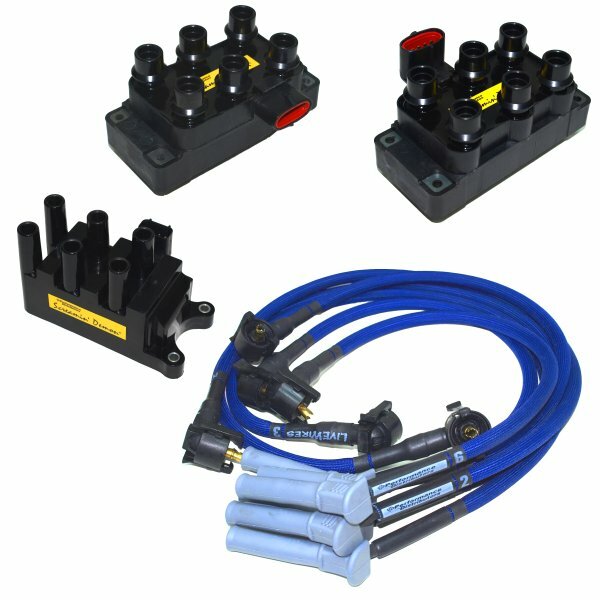 LiveWires are available in Black, Blue, Purple, Red and Yellow. The Jeep Cap and Rotor kit features brass terminals which are more conductive and resist corrosion longer than caps with aluminum terminals. This cap and rotor kit has excellent dielectric strength and resists carbon tracking. Caps for the 4.0 and 5.2 are available in Red, Blue or Black. Caps for the 2.5 liter are available in Black or Blue.